This page briefly illustrates how to use the Imatest with Omnivision OVTAPantherM. Please note that Omnivision cameras are not supported in the OSX version of Imatest. However, Imatest supports other development systems to varying degrees. Contact us for details. Load images directly from Omnivision sensors. This eliminates the need to capture images separately, store them, then load them individually into Imatest, dramatically improving productivity. Download and open the self-extracting executable (Imatest-IS-3.n.exe). This will install the Imatest Master edition and the Matlab Compiler Runtime (MCR), which is required for Imatest to run. The installer checks for the folder corresponding to the current MCR version (v8.10 as of October 2013). Matlab Libraries is checked if the folder is not found; otherwise it is unchecked. On rare occasions you may want to change this setting. Follow the remaining directions for installation. You will be able to run Imatest in evaluation mode for a limited time after you install it. If you’ve purchased it, open Imatest and press Help, License Manager (Activate). You can install Imatest on several computers, but you can only activate it on a single computer. www.imatest.com/activation/ contains instructions on activation/deactivation/moving Imatest between computers. To download Omnivision software, please contact Omnivision Technical Support (http://ovt.com/support/tech.php) and request a copy. Run the supplied executable OVTKEY.exe in administrator mode by right clicking on OVTKEY.exe and select Run as administrator. This executable will produce a file named preovt.key that is machine specific, i.e. the generated key file will work for only the machine for which it was generated. Contact support at Omnivision (http://ovt.com/support/tech.php) and supply the preovt.key file. From the preovt.key file, the contact at Omnivision will produce the key needed to enable Omnivision support in Imatest. Place the key file supplied by Omnivision into the same directory as the Imatest IS executable. With the key file in place, Omnivision support is enabled in Imatest. Connect the camera to the computer and launch Omnivision’s OVTAPantherM.exe. 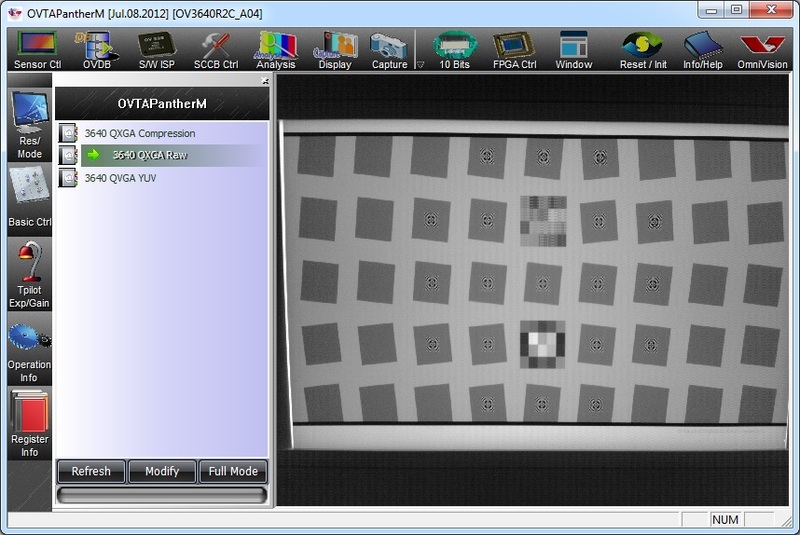 If multiple Omnivision cameras are connected to the computer, only one will be initialized at a time by OVTAPantherM. Once OVTAPantherM has launched and an image stream is being displayed, select one of the RAW sensor modes from the list that is displayed in the left pane (or by clicking the ‘Sensor Ctl’ button and then ‘Res/Mode’). See the example below for an OV3640 camera. A screenshot of OVTAPantherM with the RAW mode selected for an OV3640 camera sensor. Record the resolution (as well as the number of bits per pixel, if indicated ((Some of Omnivision’s cameras operate in 8-bit mode by default and can be changed into other modes with the appropriate register settings. 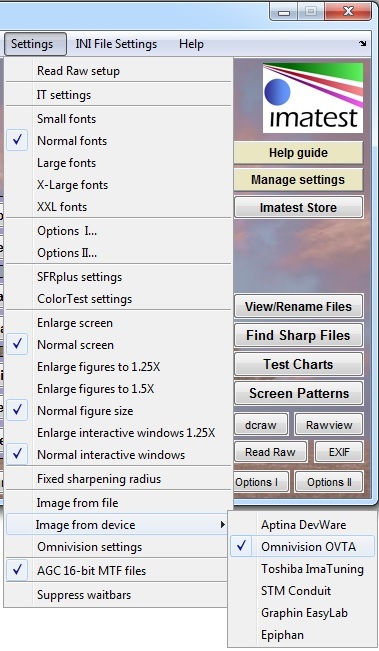 Additionally, the settings can be enabled from OVTAPantherM by clicking the ‘10 bits’ button or similar and selecting the appropriate entry from the pane on the left side. )) that the camera is operating in as it will be needed by Imatest as detailed below. 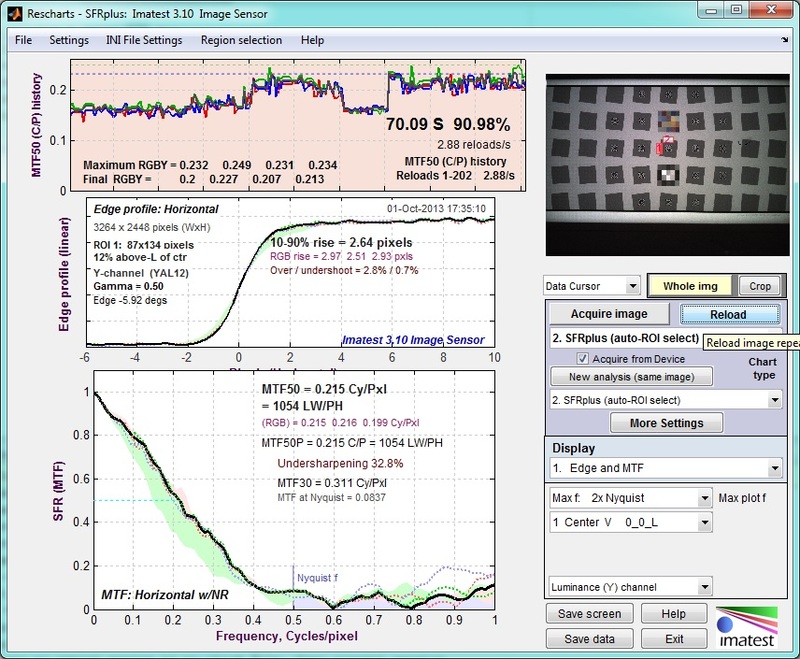 Correctly position the camera relative to the chart and adjust the camera gains if needed and allowed by OVTAPantherM. Note that additional register settings can be saved into a file and sent by Imatest to the camera as described below. 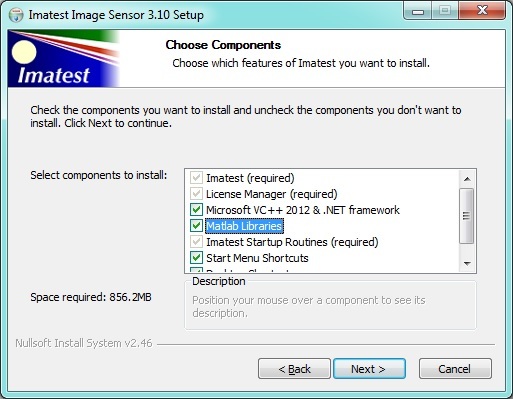 Imatest 3.10 – 4.3 (IS): Select the Settings menu, followed by Omnivision settings.In the window that appears, enter the sensor’s width, height, the number of bits per pixel (only 8-, 10-, and 12-bits per pixel are currently supported), and select the Bayer pattern. Optionally, the name of a register settings file can be entered and the name of the entry can be customized. Once complete, click the Save button, and if this particular entry is to be loaded into Imatest, click the Load current button. Imatest 4.4 and above: Open the Device Manager from the Imatest main window. Select Omnivision OVTA from the Device List and supply your settings for bits per pixel (8-, 10-, 12-, 14-, 18-, and 20- bits per pixel supported for RAW capture, 8- and 10-bits per pixel supported for YUV), Bayer patter, image width and height. Optionally, the name of a register settings file can be entered and the name of the entry can be customized. Once complete, click the Save button and this particular entry is to be loaded into Imatest. Imatest defaults to reading images from files, not acquiring images directly from devices. You can configure it to acquire images from Omnivision cameras from the Imatest main window or from any of the three modules that supports image acquisition from Omnivision cameras(Rescharts, Multicharts, or Uniformity Interactive ). Click on Settings, move the cursor down to Image from file, and check Omnivision OVTA. Check Auto Reload to enable continuous realtime reloading (updating). See the example below. Results of pressing Reload (then Stop reload) on the Edge/MTF plot of a single region of an SFRplus image. The camera’s focus was adjusted. Please refer to the Imatest Help files and associated usage guides for additional information. See Useful links, below. To purchase Imatest Master, use this link.